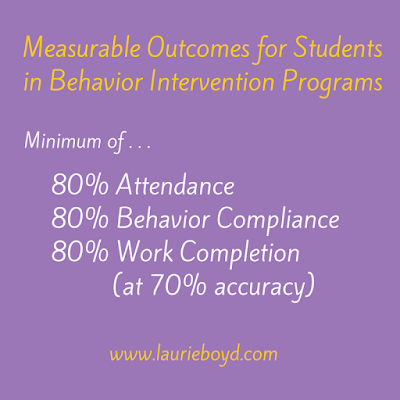 I believe we have determined a number of components that increase the likelihood of success for a school-based intervention program serving kids with chronic behavior problems. First, let's review who these students are, the ones who are so disconnected or disruptive that a school cannot keep them in classes or even in other intervention rooms. 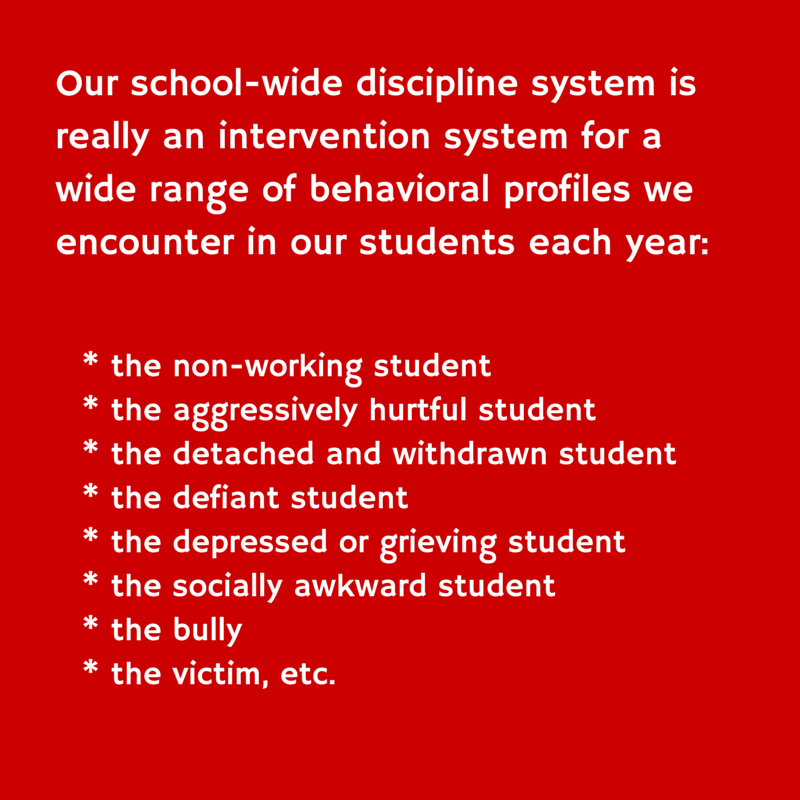 In any school, 85% to 90% of all students can be managed with a traditional rules-and-consequences discipline system. Chronic kids do not respond to typical school consequences. They don't (yet) care much about grades. They do not count the cost of their actions. They cannot delay gratification. Controlling their emotions is almost impossible for them to do. In fact, they typically overreact to correction or direction of any kind. Some are so obsessed with how others view them that they can think of nothing else; they have developed a debilitating paranoia of their peers that causes a lot of acting out. One of the most difficult student profiles is the non-working student. These youngsters have spent years doing little to no school work. Many have deep-seated trauma that keeps them from doing anything positive at all. Anger is an issue for lots of chronic students. We developed our alternative program - School Within a School - to try to reach and/or save the students we had heretofore had to put out of school with long-term suspensions or expulsions. We now "lose" only one to three students each year to expulsion for chronically hurtful or disruptive behavior, an unusual record for any school, much less a "high-needs, urban" school like ours. Ten to fifteen percent of the student population will need intervention beyond the foundational rules-and-consequences system. 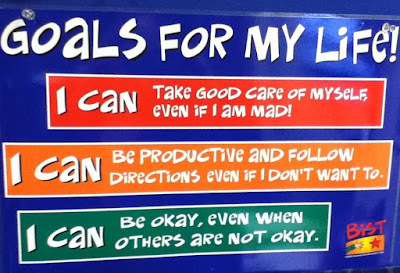 Most of these respond well to our behavior intervention model, Behavior Intervention Support Team (BIST). All teaching teams are trained in this model. All teachers know how to develop a plan, how to partner with a struggling student, how to extend grace toward a chronic student while holding him accountable, and how to process with the student about his missing life skills. When a student cannot partner with his or her regular teachers, or makes no improvement with this intervention, he or she is recommended for long-term suspension or expulsion and brought to a disciplinary hearing. In our school, because we can help students with our BIST implementation, fewer than 5% of our student population (25 students) are ever brought to a hearing. So, the multi-leveled system effectively sorts kids into intervention strategies that either work with, or give sufficient opportunity to change, to all of our most challenging students. Without the model, we would have too many students brought to hearing for us to serve effectively. four levels or layers enable us to address and care for nearly every student profile. At first, I tried to counsel the parents of chronic kids into participating in this program. We could not get the commitment of the parents through voluntary enrollment. Even if she initially accepted the offer of School-Within-a-School, when her child wanted to avoid the accountability inherent in the program, the mom, typically, came to bat to get her child out of the program. They did not fully understand how serious their children's issues were. They did not see our intervention as a way to avoid expulsion. Now we OFFER the program to almost every student we would otherwise have to expel at the disciplinary hearing. Parents and students who accept our offer sign the contract we wrote to communicate the tenets of the program. Parents and student who refuse the program have no other option than the long-term suspension or expulsion. Last year, only one student refused the program. This intervention is not a time-served consequence. The student stays in the program for as long as it is necessary. In other words, the student stays in the program until he demonstrates with his behavior that he can be successful in a regular classroom. He cannot talk his way out of participation in the intervention. His parent cannot get him out of the program, at least not as long as he is attending our school. Only as his behavior changes and he earns back his regular classes will the student rejoin his peers in regular classrooms. We learned that, in actuality, we cannot ever let go of the students who come through this program. Even those who earn back all their classes continue to need the support of SWAS staff when they experience stress in life or school. SWAS students stay in the self-contained classroom for a minimum of one school semester (sometimes longer) before they try attending any portion of a regular class. A year ago, six eighth-graders finally regained regular classes after being in the program since the first quarter of sixth-grade. Students in our district are required to pass all classes with 70% or better. We decided that no one could earn a "C" without completing at least 80% of the work assigned. Attendance is a problem for some chronic kids, so we decided that SWAS students needed to attend school a minimum of 80% of the time. 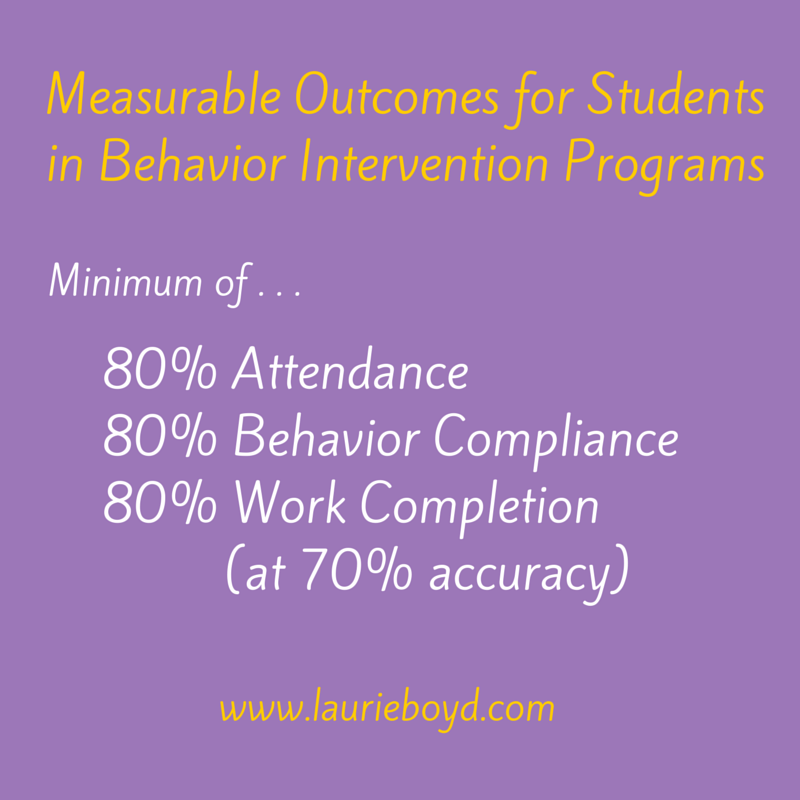 Because they all worked on behavior goals, they had to have acceptable behavior a minimum of 80% of the time. 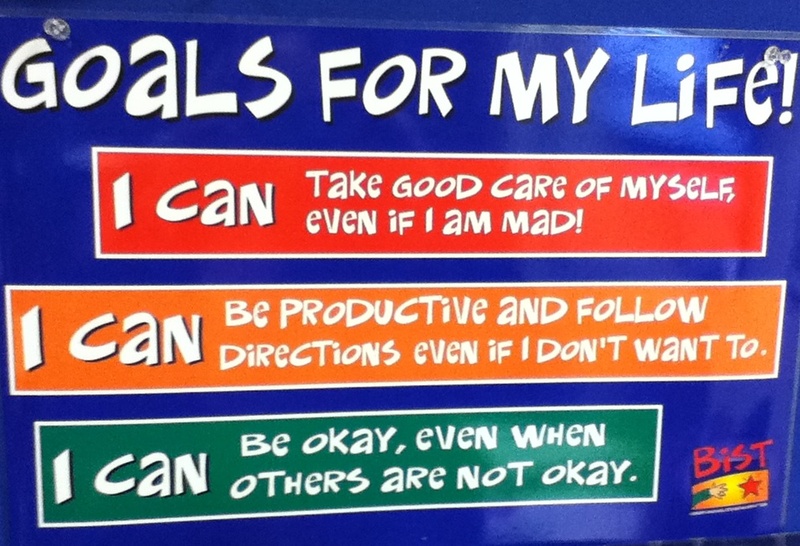 It is easy for us to communicate the exact behavior that will enable our chronic kids to be successful in school. They cannot be hurtful or disruptive. They must follow the five common rules for every classroom. Those are the same expectation in every room in the school, so those are the expectations for the SWAS classroom as well. The SWAS teachers have the students complete a monitor sheet every day that requires them to reflect on their behavior, their attendance pattern, and their work completion. Every single day, these students know exactly where they stand in the program. They know whether or not they will pass their two-week review. Students have to pass their two-week review for the privilege of staying in school full time. If they do not pass their review with 80% attendance, 80% behavior, and 80% work completion, they stand to lose a portion of the school day. First, they lose two hours in the afternoon, leaving school at 1:00. They are still responsible for their school work. If the student continues to fail his reviews, he may lose an hour in the morning as well. If a student even then fails his reviews, he will be terminated from the program and suspended for the remainder of the semester. Keep in mind that this is much more than schools are required to do for incorrigible youth. Our district schools have offered an "After School Program" in lieu of a long-term suspension for years. This program is only two-and-a-half hours a day, without the level of support we give. Of all the students who have been in SWAS, only one failed to earn back the full school day within the next two-week period. Only two students in three years have stopped attending or failed to earn back classes. 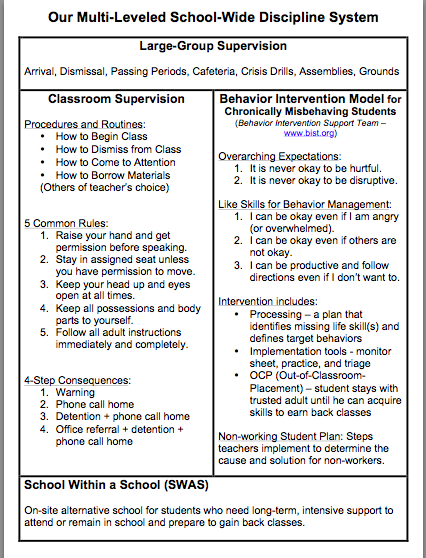 I believe that our SWAS kids need to have a daily reminder that their behavior problems are serious, that they need help from adults to manage their feelings and their conduct. They may not always, but they do right now. They "deserve" suspension/expulsion; they need the love, acceptance, partnership, commitment, and wisdom of adults. Students who are this chronic, we have found, need a complete paradigm shift toward school and life. They also need to think differently about themselves, their worth, their significance. 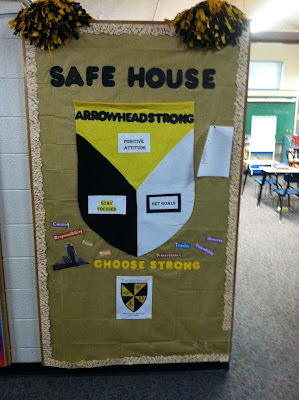 My SAFE HOUSE (another term for our School Within a School program) staff is so good at helping kids change their thinking about themselves. SWAS students need a long time to transition back to regular classes. We cannot just throw these kids back into classes as soon as they are compliant in SWAS. They need assistance and coaching to deal with challenging curriculum. Chronic students give up quickly and often have not developed the stamina to exert effort toward achievement. Arrowhead family, and we expect to reintegrate them into regular classes. 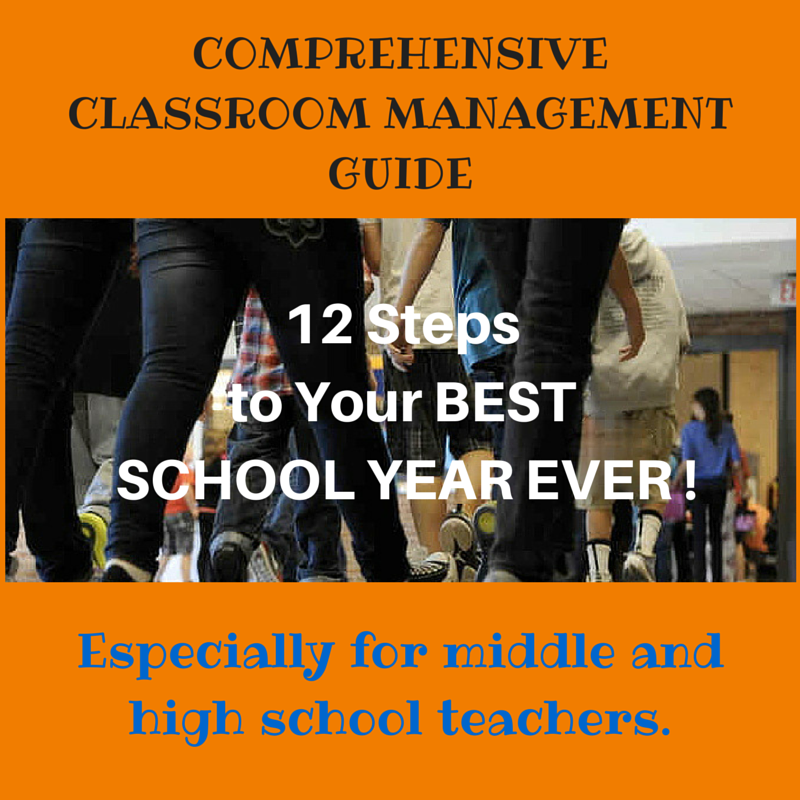 These students need assistance and coaching to manage relationships with other teachers. Chronic students often blame adults for their own failures. It's easier than looking at how their emotions derail them in classes. 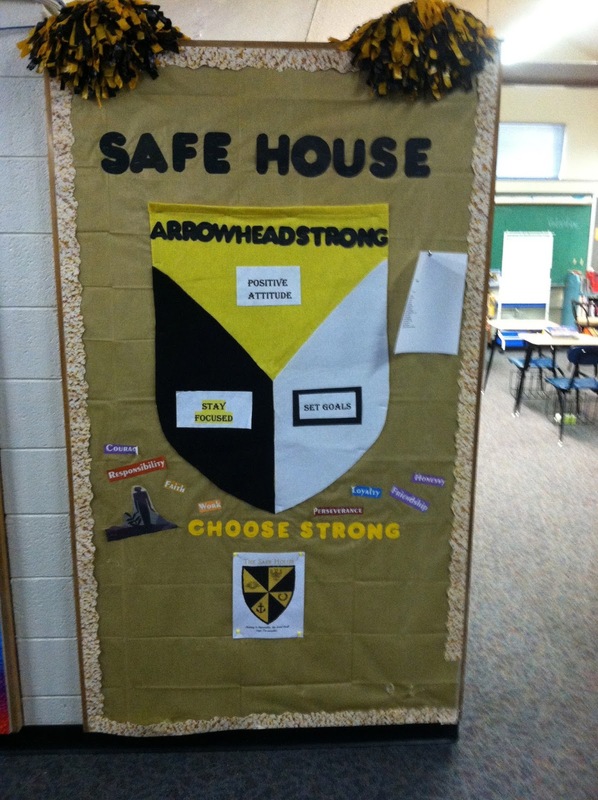 As they transition back to regular school, they need the stability and security of the program and the SWAS staff. When you house all the chronic kids in a separate location, where they interact only with other chronic kids, they have no peer models of what "normal" kids manage to do in school or the opportunities that their peers can enjoy. When they return to regular school, they have little support for their transition. Because the alternative setting does not "cure" the student, these youngsters often default to their former defense mechanisms. They are less likely to connect to the school because they have been apart from it for so long. SWAS students have been amazingly receptive and responsive to the academic part of the program. Because the teachers keep the same 16 to 20 kids all day, they come to know their academic needs well. They facilitate the application of all the resources of the school to help their students. Many of our SWAS students struggle with reading, so our SWAS teacher collaborated with our Targeted Literacy Instructor to include these kids in her reading intervention classes. We arranged the SWAS schedule so that the teacher could attend the class with the students. When our new math teacher leader initiated a change in how math was taught throughout our building this past year, we included SWAS class in her goal for all kids to learn math. She and the SWAS teacher collaborated to invest these historically disconnected, unsuccessful students in learning. By December, all of the SWAS students showed growth on the MAP math assessment. My next post will describe the classroom routines, the behavior management system, the learning activities, and the schedule we implement in School-Within-a-School. In Part I of this topic (Programs that Work with Chronic Kids: Adequate Staffing and Support for Staff), I identified the critical component of adequately staffing your program and the critical component of providing sufficient support for your staff members who work with your most difficult students. 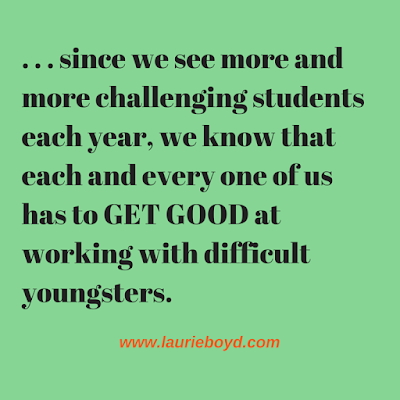 In this post, I will present some of the key characteristics that are important in individuals who are assigned to work with our most challenging young people. We can't always determine from an interview whether a candidate has the essential characteristics. But identifying these characteristics can help us communicate an expectation for the individuals we hire to develop and exhibit these traits. 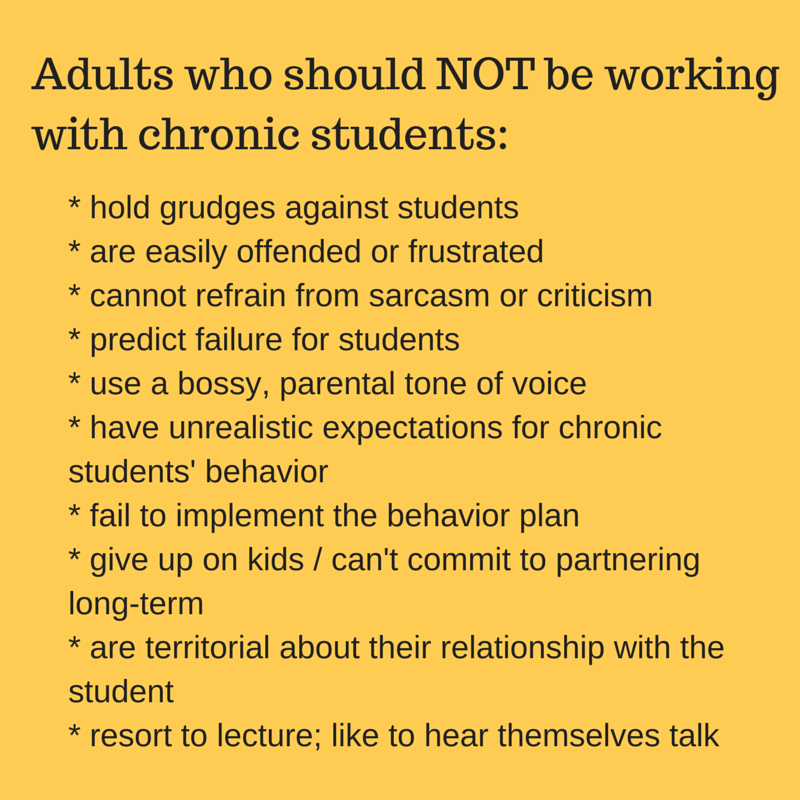 The most important characteristic of an adult working with chronic students is an even-tempered personality. Usually, this means the person can speak quietly and move as if he or she is in full control of his/her body and mood. This does not mean that the adult will have a low-energy level, but it does mean that they won't appear so hyper that they have to hear themselves talk all the time or insist on lecturing kids. The ideal candidate for this position will be able to speak the truth in love to young people. He can articulate an understanding of how young people tick, and he demonstrates the ability to address habits and emotions that lie under the outward show of behavior. He can resist adrenaline floods of frustration because he is confident in his final authority as the teacher or adult, and he realizes that students' ugly behavior usually indicates deep pain or a cry for help. The suitable adult realizes that building trust takes time and consistency and that blaming or criticizing the student destroys trust. He can model using his words to communicate his needs. The ideal candidate for a position like this is a coachable individual. He is self-reflective and eager to participate in any training that will increase his knowledge and skills for reaching traumatized kids more effectively. He desires professional development and applies all he learns to his daily interactions. 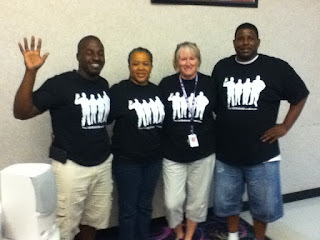 The teachers on my team are highly motivated to research solutions to problems or to initiate ideas for reaching kids. A person who shows any characteristic that is opposite to an even temper should not be selected for this kind of job. A person who demonstrates opposite characteristics is easily offended or frustrated. He holds a grudge against students. He can't stop himself from using criticism or sarcasm, and even resorts to predicting life-long failure for the student. He uses a bossy parental tone, a lecturing mode that incites chronic kids to anger or sullenness. These individuals hold unrealistic expectations for chronic kids. They seem to think that because the student has a specific behavior plan, or has reached a certain level of intervention, that the student should now be able to control his behavior and should act just like kids who do not have behavior issues. These adults, then, neglect to perform their part of the student's intervention plan, effectively undermining our entire program and setting the student up for more failure. Just as bad is the adult who lets kids run over her, who resorts to bribing kids for minimal compliance, or who lowers standards for behavior. Most adults do not understand how long it takes to change a kid who has entrenched reasons for his or her chronic behavior issues, much less how to coach the acquisition of life skills for as long as it takes (sometimes years). Eventually, you will hear these individuals say things like, "I've had it. I'm through with this kid. I can't take it. He's hopeless." 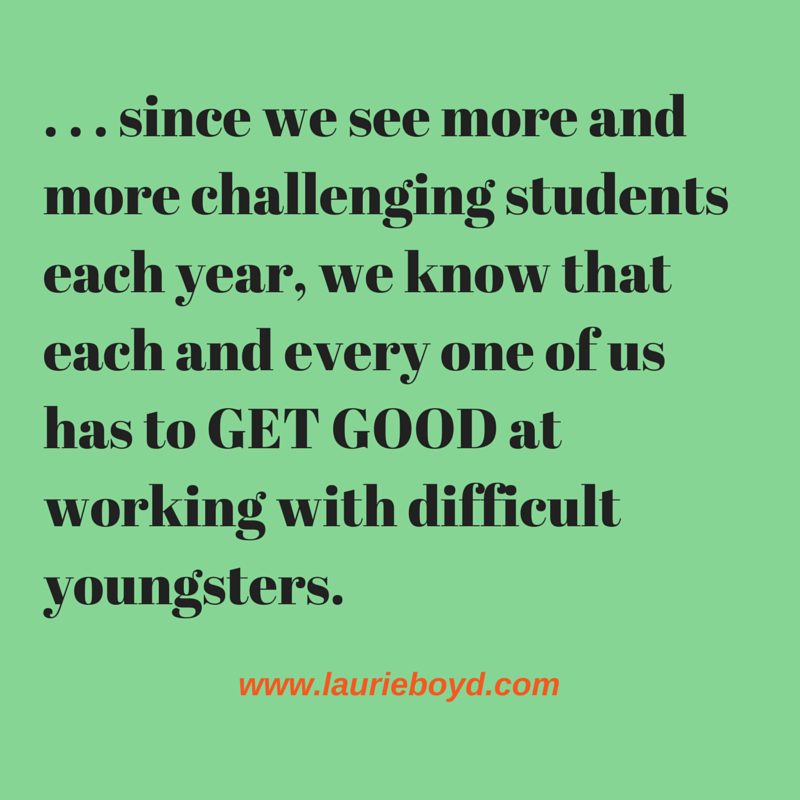 "Why Do You Want to Work with the Most Defiant Kids in School?" At the core of this issue is the individual's motivation for wanting to work with the ugliest-acting, most unproductive, most hopeless kids in school every year. "I need a job," cannot be the only reason an adult wants to do this work. The suitable adult knows she has something that young people need - persevering love for and belief in kids, especially when the kids cannot yet love or believe in themselves. These adults believe that what they do is too important to quit on kids. They welcome collaboration with like-minded peers to assist students as much as they can. What they do is too important for them to spend their time protecting their turf or seeking attention and accolades for themselves. Many of the kids my SAFE HOUSE team serves do not come back to thank them for helping them to turn their lives around, to accept themselves, and to appreciate others. These youngsters' improved mental and emotional health is the teachers' reward. They revel in their students' progress and success. It goes beyond conformity to school behavioral norms. These adults care about their students' lives, current and future. They are FOR them and WITH them in their hearts, and their students know it. That's what chronic kids need in adult partners. Is our Program Replicable in Other Schools? I sometimes hear that other schools cannot get the same results my SAFE HOUSE does because they do not have adults of the same caliber or expertise for their programs. Actually, the qualities that make good candidates for working with chronic kids make good candidates for working with all kids. School leaders have to motivate and inspire all adults in our buildings to develop character traits and expertise that enable us to make a significant difference in our students' lives. Our program is replicable in any school where people are committed to make it work. Now that we have described the mindset and personality of the adults who are successful with the most difficult students, we will present the components of the program that result in most of our chronic students staying in school and reconnecting with their peer group as well as with other school personnel. Look for my next post: Programs that Work with Chronic Kids, Part III: Key Components. One of the most enjoyable aspects of my job as school principal is designing programs. I love to collaborate with members of my school team to develop procedures and interventions that systematically meet the needs of kids. 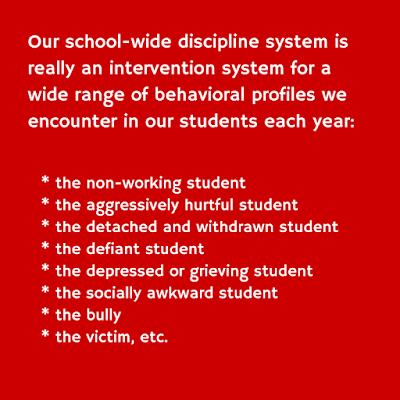 Our school-wide discipline system is really an intervention system for a wide range of behavioral profiles we encounter in our students each year. Since oppositional behaviors threaten to undermine anything positive we attempt to achieve in our school, and since we see more and more challenging students each year, we know that each and every one of us has to get good at working with difficult students. Kids aren't coming to our doors with fewer problems each school year. They are coming with more. We quit bemoaning this fact and set ourselves to finding solutions for our kids and for ourselves. In a school environment, this usually requires a systematic approach - a program that sets expectations, identifies and distributes tasks, provides ongoing training and reflection, and requires monitoring. Being able to be successful with difficult students makes the difference between a good school and a great school, a decent staff and an exceptional staff. Any semi-literate person can make assignments, give grades, and support kids who are already motivated. Coaching dysfunctional youngsters into acquiring missing life skills is beyond the scope of most teacher training programs, but that's what school personnel need to be able to do in order to be successful with a significant portion of our population. Being able to keep disruptive and defiant kids in school when they don't deserve it, without allowing them to hurt or impede others, is - and has been - a tremendous challenge for schools across the nation for decades. The behavior model we learn and practice in our school holds the philosophy that kids get what they need, whether they deserve it or not. For the past three years, we have been implementing a program for kids with chronic behaviors that we operate within our school. It is an alternative school for students whose incorrigible behavior necessitates, finally, their removal from the regular school setting. In most schools, this behavior calls for expulsion. We call our alternative program "School Within a School" (SWAS). Each of the past three school years, we have served between 15 and 20 students through this alternative. This program that we developed for our most severely chronic students has been successful even beyond my highest expectations. I want to share the components of the program that we believe make it work so well for chronic kids, young people we would have considered unreachable a few years ago. 1. Adequate staffing and considerable support for the adults who work in the intervention programs. Consider how many students need intensive intervention and the specific challenges of this population. In the same large room in our school, we operate an in-school suspension program, the Recovery Room step for our building-wide behavior model, and SWAS. This means that Room 128 is likely to have 30 to 40 students assigned to it on nearly every day of the school year. These 30 to 40 students will not be normal scholars. They will not be well-behaved or easily managed. These students will be very good at avoiding work, at shifting blame and responsibility, at overt undermining or passive-aggressive rebellion. They will be hurtful toward one another and toward teachers, belligerent, sneering, cussing, sleeping, ridiculing. They will refuse to talk, or they will refuse to stop talking. They will lie about teachers and the program to their parents. They will sulk, pout, and push emotional buttons as often as they can. One mistake that many school leaders make is assuming that any adult can step into this kind of program and be able to manage these students, with no extra training and little support. The expectations for these rooms is typically "housing" students until their punishment time is up. In SWAS, our expectation is true and effective intervention that results in a CHANGE. I know I must provide ongoing support and training to those who implement these programs. Our district provides a full-time "In-School Suspension Monitor" to every secondary school. This is a classified position that does not require a teaching certificate. The district also provides a 30-hour-per-week "Short-term Suspension Monitor," also a classified position, who, in most schools facilitates the building's "After School Program" for students who have been long-term suspended. This program used to be offered for only two-and-a-half hours after school each day for the duration of a long-term suspension (from five weeks to a full semester); hence, the name "After School Program." Once the district provided this 30-hour position, schools could provide a similar program during the school day, and we did this too, at first. The 8th-graders who were long-term suspended attended a morning session of three hours. The 6th- and 7th-graders who were long-term suspended attended an afternoon session of three hours. Work was sent by the students' regular teachers, and the monitor kept the kids on task and tried to help them complete their school work. While these programs offered assistance with school work, my classified staff members were not able to deliver instruction for all four core courses across all three grade levels. I knew I wanted our outcomes to include the reconnection of detached, defeated students to the process of schooling, but we struggled to keep kids awake and interested in school work at all, since they literally sat in one seat all day without instruction or discussion of concepts. We could not allow these students to remain in classrooms because they were too disruptive, but we had to figure out how to make them successful with their academics. I decided to experiment with assigning a certified teacher to the program. I have a teacher with quite a lot of experience with our behavior model, whose peculiar strength is the ability to motivate and hold accountable the hardest kids. We had been using her to teach math for the grade-level with the most students. At first, I scheduled her to teach two of her regular Math classes and one 90-minute course of any content area needed in the ISS room, with kids who were in ASP as a result of a long-term suspension. with members of the SAFE HOUSE team and my assistant principal. A certified teacher who knows how to teach content is a critical component of our success with chronic kids. This is a very good use of one certified teaching position. 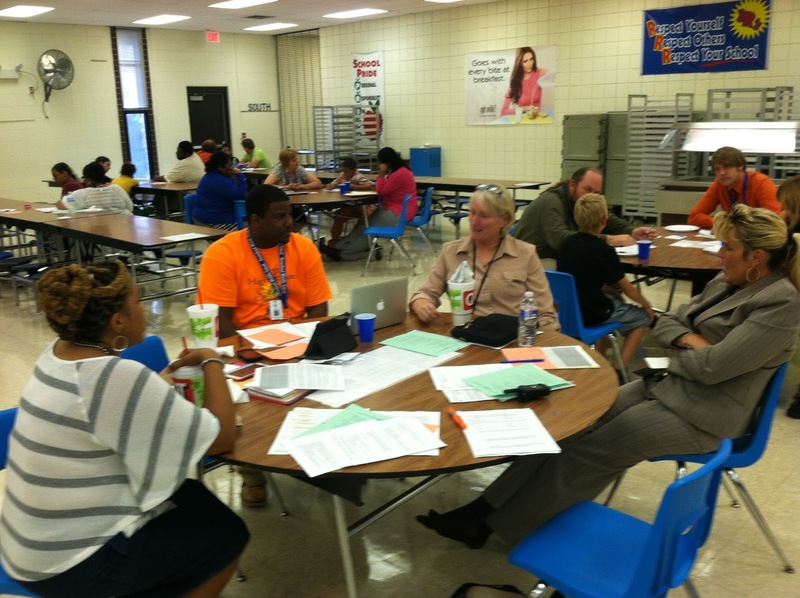 Our district provides teachers to buildings at a ratio of 1:24 (one teacher to 24 students). Even though taking my one regular teacher out of the rotation of classes caused increased class size in some places on the master schedule, the payoff has been well worth it. Since close to 24 students regularly inhabit the alternative room, it makes sense to assign a teacher to this group full time, so I did, beginning two years ago. Running SWAS the way we do keeps the worst-acting students out of the regular classes until they can manage their behavior. My core teachers understand that a few extra kids in class is a fine trade-off for not having certain severely disruptive kids in class. I felt like the adults over the three programs might want to divide and conquer their load of students, and I looked for rooms in which we could house the different programs separately. But the teachers (we call them all teachers, although one is certified and two are classified) did not want to break up the programs. They described how critical the presence and partnership of the other adults had become to them. to our neediest students. This is the SAFE HOUSE staff. The support of these teaching partners made it possible for each of them to maintain their sanity, keep control of their own emotions, and figure out how to approach issues that arose in any one of the three programs. 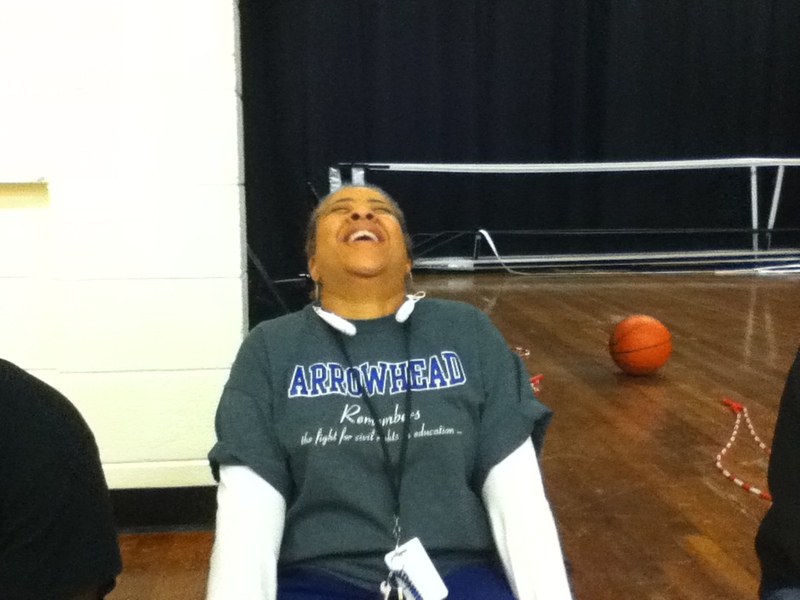 Being able to interact with one another in front of their students enabled the three adults to model healthy peer relationships, and introduced an atmosphere of fun and humor among the adults that eventually made the kids feel more at home and more trusting of them. In addition, they all acknowledged that they learned from one another, and they became adept at using each one's particular skills and strengths to serve the kids in all three programs in their classroom. Having two other adults in the room even made it possible - where it would not have been otherwise - for one adult to leave the room for a restroom break, to confer with a parent or an administrator, or to make a private phone call. Coach Mo (life coach / ISS monitor) confers with Assistant Administrator, Nancy Hale. To make sure I am fully supporting these teachers, I meet with them on Wednesday mornings. They assign the students independent work, we communicate the expectation that they will not interrupt us except for an emergency during the hour I am there, and we talk together quietly around a table right there in the intervention room. We discuss specific kids' progress with their missing life skills, ideas for more efficiently implementing services, issues with parents, and curriculum and instruction for students who spend most of their day in this room. I have described how we staff our programs for chronic students and the importance of a supportive team when working with difficult students. There is still more to be said about the qualities or characteristics of adults who are effective with challenging youth and how to determine who might be a good fit in an interview. 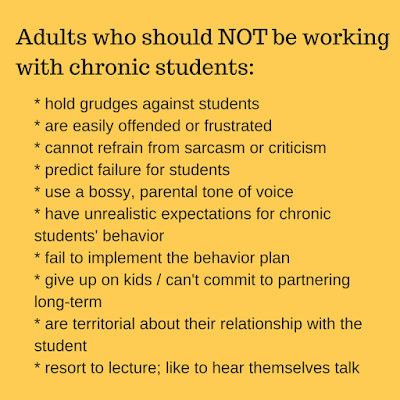 And there are many more components we feel are necessary for programs that work with chronic students. Please read and share Part II of Programs that Work with Chronic Kids: Characteristics of an Effective Interventionist.